I get a little annoyed with temptations, as if I am above being tempted. I know I’m not, but I would love if I could go to a party and just not want to eat the hot , creamy, buffalo chicken dip. Why can’t exercise always be a joy and it never cross my mind not to do it? Unfortunately, we are all faced with temptation. 1 Corinthians 10:13 says, Every test that you have experienced is the kind that normally comes to people. But God keeps his promise, and he will not allow you to be tested beyond your power to remain firm; at the time you are put to the test, he will give you the strength to endure it, and so provide you with a way out. It makes me feel better to know that everyone has temptations. They are completely normal. Temptations don’t come because we are a failure or because God is seeing how faithful we can be. Temptations are a part of life. So what do we do when temptations come? There are so many times when we set ourselves up for failure. Remember, my episode with the Lays chips. You can read about it here. I know I can’t eat just one chip. I know it is a trigger food for me but I bought not one bag but TWO bags of chips! Temptation will come but don’t create it for yourself. 2. Put some distance between you and your temptation. There was cake at work yesterday. There was cheese strudel pastry the day before that and last week, it was Krispy Kreme donuts. There is always some kind of temptation in our work room. The best thing I can do is to avoid it. The work room is the short cut to other offices but on days that temptations lay in wait, I take the long way around. Wikipedia is not usually my go-to for resources, but today, when I Googled the word temptation, I found something pretty good. It said temptation is a fundamental desire to engage in short-term urges for enjoyment, that threatens long-term goals. Temptation is always a short-term urge. Giving in to temptations creates short term enjoyment but it’s a surefire way to demolish your long-term goals. 1 Corinthians tells us that God will never tempt us beyond what we can handle . It goes on to say that he will provide a way out when we are tempted. I know sometimes this feels far from the truth. But He is such a loving God and I have to have faith that what He says is true. 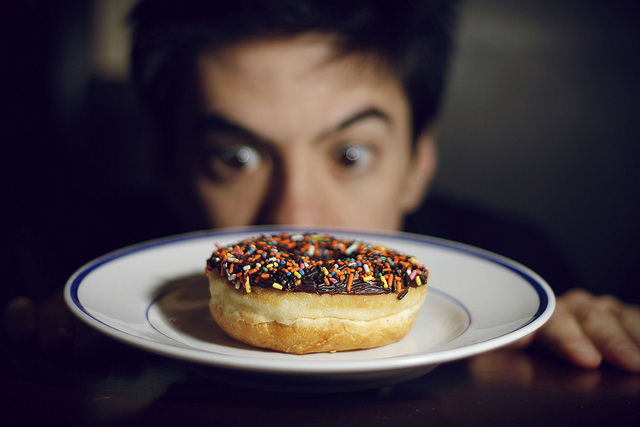 Often when I am tempted by food, I ask God to show me the way out and give me the ability to resist the temptation. Easier said than done, right? I know. Join me in reading Kimberly Taylor’s great weight loss devotional. Thank you Lord for your Word. Help me to remember that temptation is a part of life. Thank you for your love and always providing a way out of temptation. Keep me focused on my long-term goals and not on short-term joy. Amen. Next > What Are You Struggling With? Thanks for stopping by my blog. I love this post because glutton is the sin I struggle with most. There were helpful tips for me. Thanks!